← See ya later, tangles! Ahava means love in Hebrew. And, oh do I love Ahava! This luxurious line of Dead Sea skincare is packed with active Dead Sea minerals from the healing and magnificent body of water in Israel. And, it has anti-aging written all over it (love, again). Let’s dive in to all these powerful products. Dead Sea Osmoter Eye Concentrate 0.5 oz., Time To Hydrate Essential Day Moisturizer 1.7 oz. & Time To Revitalize Extreme Night Treatment 1 oz. The Dead Sea has the reputation for being among the most therapeutic to all skin types. People come from around the world to bathe in this wondrous, magical sea. What is it that makes it so special, so loved, by so many? It is unknown the exact reasons, but Dead Sea minerals and mud seemingly transform and rejuvenate, naturally. Natural is important to me. I don’t want to throw a bunch of potentially harsh chemicals, or who knows what, onto my delicate face. Our body is our temple, right? 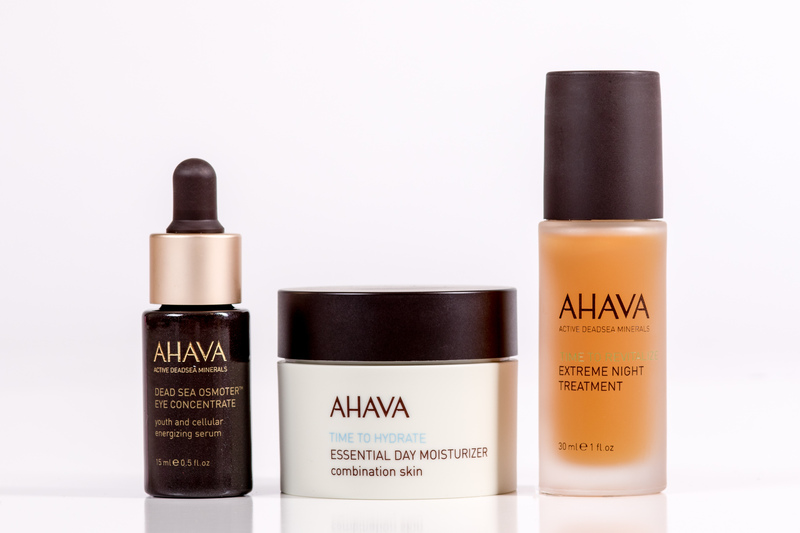 What I especially love about Ahava is it is divided into targeted categories – Time To Clear, Time To Hydrate, Time To Smooth, Time To Revitalize and Time To Treat. So, it’s super easy to pick exactly what your skin needs. Personally, I pick them all! I want all of those things and having it broken down, allows me to choose one or two products from each. Clear up with a cleanser, mask or exfoliator. Hydrate with Active Moisture Gel Cream or lotions for the driest to the oiliest skin. Then, smooth out those fine lines and wrinkles, around your eyes or mouth, even your hands, with nourishing creams and gels. Look revitalized with Extreme Night Treatment and more. And, last but not least, give your skin a treat with a renewing peel to reveal a soft, youthful glow. You can’t go wrong with any or all of Ahava’s Dead Sea skincare line. Are you in love, too? My guess is yes. This entry was posted in anti-aging skincare, Dead Sea and tagged Dead Sea skincare. Bookmark the permalink.